Navarino Island (Spanish: Isla Navarino) is a Chilean island located between Isla Grande de Tierra del Fuego, to the north, and Cape Horn, to the south. The island forms part of the Commune of Cabo de Hornos, the southernmost commune in Chile and in the world, belonging to Antártica Chilena Province in the XII Region of Magallanes and Chilean Antarctica. 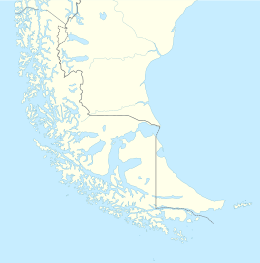 Its population is concentrated primarily in the communal capital, Puerto Williams, and in small settlements like Puerto Navarino, Río Guanaco and Puerto Toro. The highest point of the island is Pico Navarino at 1,195 m (3,921 ft). The island is a popular destination for fly-fishers. The indigenous people were Yahgan, estimated to have migrated to Tierra del Fuego more than 10,000 years ago by a land bridge that has since been submerged. From there, they went by canoe to other islands. History and archaeology may be the most valuable resource of Navarino Island and its adjacent sectors. It is considered to have one of the most dense concentrations of archeological sites in the world. The Yahgan were nomadic people, and moved their settlements on a seasonal basis. Their middens show their dependence of fish and shellfish for food, as well as some vegetables that they gathered. There is a Megalithic Yaghan archaeological site dating to about 10,000 years ago near Wulaia Bay, which C. Michael Hogan terms the Bahia Wulaia Dome Middens. Numerous remains of huts surrounded by ring middens have been found on the lowland terraces. Interest in the Yahgan culture attracts tourists. At the regional museum, the Martin Gusinde Anthropological Museum, exhibits of the Yaghan culture: their dwellings, fish traps, and crafts; and the remains of the 19th-century English missions can be seen. Aquatic birds, and the geology and botany of the island, also attract tourists. The coast of Navarino Island offers opportunities for sea kayaking among small barren islands and channels surrounded by native vegetation and populated by a rich variety of birds. There is fishing in the Murray Channel. Boat trips can also be taken to visit the glaciers of the northwest arm of the Beagle Channel (located in the Alberto de Agostini National Park), and towards Cape Horn and Chilean Antarctica. There is a hiking circuit around the jagged pinnacles known as the Dientes de Navarino. The trail passes peaks known as Cerro Clem and Montes Lindenmayer, named in 2001 by the Chilean Ministry of Natural Resources for the author of the Lonely Planet guide. There are also areas for rock climbing. Several ranches have been established on the island. The northern section of the island is suitable for horseback riding. Salmon trout are found in abundance in Navarino Lake, and on the north coast of the island, the sea enters deep coves suitable for fishing snook. Having a polar climate (Köppen: ET), in the northern coastal strip, the site of Puerto Williams, the annual average precipitation is 467 mm (18 in)., with a temperature of 6 °C (43 °F). The average temperature in the warmest month is 9.6 °C (49.3 °F), and in the coldest month 1.9 °C (35.4 °F). In the more southern areas, annual precipitation increases to about 800 mm (31.50 inches), with a slight diminution in temperatures. Precipitation is distributed more or less uniformly across the year, and some falls as snow. In the extensive southernmost part of the island, including Lakes Navarino and Windhond, there is an increase in precipitation, a diminution of summer temperatures, and an increase in the winter temperatures by wind drift. In the North end of the island the vegetation is characterized by the deciduous Magellanic forest, whose characteristic species are Lenga Beech (Nothofagus pumilio), with Ñirre Beech (Nothofagus antarctica) in the driest areas, Coihue of Magallanes (Nothofagus betuloides) in the wettest areas and some shrublands and Magellanic moorland in areas of poor drainage. Immediately to the south is the evergreen Magellanic rainforest, probably associated with the increased precipitation, the greater altitude and an improvement in the drainage. The characteristic species is Nothofagus betuloides (Coihue of Magallanes), forming pure communities in sectors of greater altitude or coasts exposed to the wind. The south portion of the island, surrounding Lakes Navarino and Windhond, and the territories of the southern coast, have a vegetation of Magellanic moorland. This includes a series of vegetal communities, the Esfagnosa Tundra (Sphagnum magellanicum) and the Pulvinada Tundra (Donatia fascicularis - Astelia pumila). At higher altitudes, the terrain is Andean Desert, which lacks trees or tall shrubs and is less than 30% covered by vegetation. Cultural historical sites are Bahia Wulaia and the English Mission of Douglas Creek. The large Stirling House, an iron Meccano construction brought in 1869 from England by the Anglican English missionaries, used to be in Ushuaia. It was moved to Tekenika Bay, and then was installed for mission use at Douglas Creek. In the Yahgan cemetery at Mejillones Bay, tombs dating from the first half of the 20th century show elements of religious syncretism. Villa Ukika is a district of Puerto Williams where the last few Yaghan people live. Puerto Navarino, a fishing port for king crabs, has lovely wooden buildings, constructed mainly in the 1930s. Puerto Toro is the world's southernmost settlement. Skiing is available in Cerro La Bandera, near Puerto Williams. Whales and orcas can be seen in Windhond Bay. The area of Isla Navarino and the surrounding islands have been declared a UNESCO Biosphere Reserve in June 2005, called Cabo de Hornos Biosphere Reserve. Puerto Williams can be reached by air from Punta Arenas, by DAP through the Guardiamarina Zañartu Airport, daily except Sundays. In addition there is a weekly ferry, crossing the Strait of Magellan and the Brecknock, Cockburn and Beagle Channels. The boat trip takes between 30 and 36 hours. As of January 2011, there was also a commercial connection by motorboat between Ushuaia and Isla Navarino. ^ Lafferty, Jamie (March 28, 2017). "Chile: fly-fishing at the end of the world". Financial Times. Retrieved March 30, 2017. ^ Hajek, Ernst; Castri, Francesco (1975). "Bioclimatografia de Chile" (PDF) (in Spanish). p. 222. Retrieved 23 April 2015. Wikimedia Commons has media related to Isla Navarino. This page was last edited on 15 February 2019, at 08:27 (UTC).